By combining Long-exposure manual (M*) mode and Exposure delay mode, long-time exposure while minimizing vibration can be performed easily without using a remote cord, by soft shutter release. For star landscape shots with the D810A set on a tripod, Long-exposure manual (M*) mode is convenient when a shutter speed longer than 30 sec, the longest selectable with conventional M mode, is needed. If you combine this with Exposure delay mode, image blur can be effectively prevented without a remote cord. 60, 120, 180, 240, 300, 600, 900 sec. Note: Long-exposure manual (M*) mode enables an easy manual setting of exposure time over 30 sec. as above. It does not necessarily mean image processing suited to long exposure. Bulb and Time can also be selectable. This mode is selectable via "f4" in Custom Setting menu. 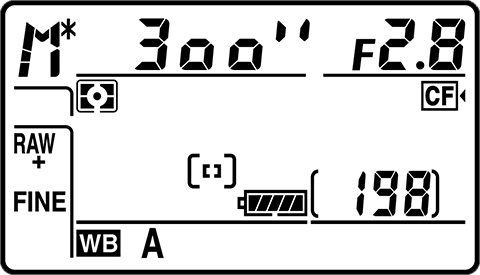 This enables delaying shutter release until one, two, or three seconds after the mirror is raised, thus preventing possible image blur when using long exposure time of over 30 sec. even without a remote cord. When it is windy, it is recommended to remove the camera strap from the body to reduce camera shake. Detaching the remote cord will help further as it is also likely to induce unwanted camera shake, and using exposure delay will be particularly effective in such situations.